Our team has worked in the tourism industry, so we understand the daily stresses of running your business. It is why we are dedicated to providing you with software to make your business run better. If you’re still on the fence about AWaiver, we are at the ready to answer some the most common concerns when it comes to our digital waiver software. Is digital really so much better than paper? We truly believe so, and so does the insurance industry. Our digital waiver has a CLEAR photo of the person signing the waiver, combine this with the GPS location, time and date stamp, and we can help eliminate the claims of “I didn’t sign that.” The whole reason we have customers sign the waiver is because of insurance requirements, the insurance industry has approved the use of electronic waivers, and some actually offer a premium discount when switching to our e-waiver signing software. 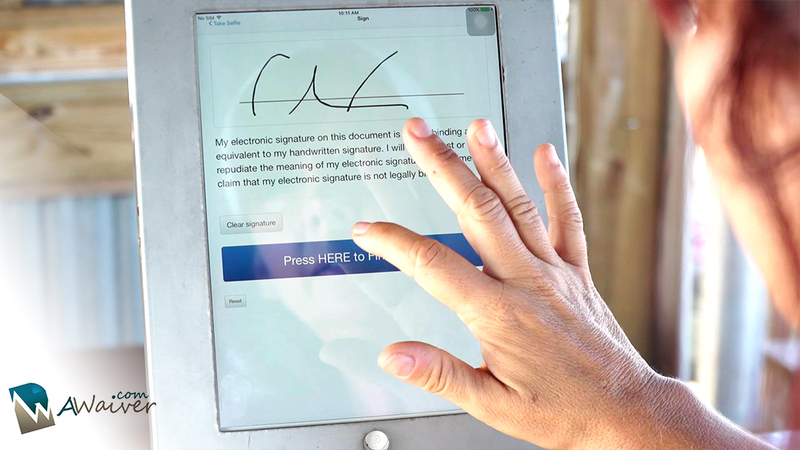 Will signing digital waivers slow down my business? Not at all. Our clear to follow instruction means you can leave the customer to complete their waivers without assistance. Plus you receive the added protection of having the waiver stored onto our secure cloud. What happens if I lose an internet connection? A lost connection doesn’t mean lost business, just switch to offline mode. AWaiver is designed to work with or without an internet connection. Your clients can continue to sign waivers, and then once you reconnect to the internet, the software will automatically upload all of the signed waivers. Will AWaiver integrate with any reservation software I have? AWaiver runs seamlessly alongside any reservation software you use. Unfortunately, there are many different reservation software out there, and currently, we don’t integrate with them all. Yet, several AWaiver customers have switched from competitors’ waivers that do integrate with their reservation software like Fare Harbor, because of the superiority of AWaiver’s signing capability and intuitive search function. A superior software means the waiver process is quicker, making AWaiver a great companion to all reservation software. How will I keep track of who signed? All waivers will appear in a pending queue for you to approve, the waivers are separated by activity and listed by date and time signed. You can leave them in this queue until the person arrives for the activity or pre-approve all waivers and then when they arrive for their activity you can search signed waivers for the customer’s name. AWaiver has one of the easiest search functions around, you can search by the first name, last name, date signed or even partial name. Whichever way you look at it, finding a signed digital waiver is light years faster than finding a paper one from the 100 + boxes you have in storage. What is the minimum system requirements? Yes, at home computers need a camera and a microphone in order to use AWaiver. The software works with both Macs and PCs. Apple computers need to be using either the High Sierra or Mojave operating system in order for our software to work properly. Android mobile devices should be using the Lollipop or newer operating system to ensure the waivers process quickly and Apple mobile devices should be running iOS 11. Visit our detailed post on what you will need to get started. Want to Upgrade to Digital Waivers in your Business? Here’s What You’ll Need. Can a waiver be changed and tampered with? No, once a waiver has been approved by yourself or someone in your employ, the waiver can’t be changed. However you can add notes to the waiver at any time, this is useful if you need to document any incident reports. Can I customize the fields? We have designed AWaiver to process customers quickly while onsite at your facility. When setting up your AWaiver account you can select how many fields you need customers to complete. Yet, it is important to note, adding additional information fields slows down the waiver process and causes delays in getting people to their activities. So our system is designed to work in conjunction with a reservation system where all other personal information would be stored. If you still have any questions or would like to schedule a free demo, contact our Director of Sales, Kat Abbott at (800) 742-4781 x602.